Last year was about beauty in structure and design with the cloud cake. It had two different flavour possibilities (like this year) and it was delicious as well as huge. It fed 6 people and if we hadn’t been so hungry (like, if we’d bothered to eat dinner) it would have served more because it was HUGE. This year Haagen-Dazs have a cake which is both simple and complex with an unexpected chocolate fudge surprise somewhere unexpected. This year’s cake has been designed by nendo and made in Paris along the Champs Eleysee and brought over to the UK. There are (understandably) a limited number of cakes available for purchase and the two different flavours can be discerned through the colour of the houses on top of the cake. There is a macadamia nut brittle with dulce de leche ice cream or in a move to create something with the new flavour one with vanilla and the new florentine flavour. You can tell the difference as the first has chocolate houses and the second has pink houses. The Macadamia Nut Brittle and Dulche de Leche cake I had was amazing. 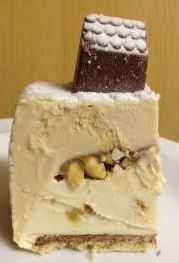 The two distinct ice cream layers were separated by a thin layer of salted caramel sauce and roasted almonds which retained their crunch. This is a huge cake though and impossible to cut straight out of the freezer so give it 5 – 10 minutes to get a bit softer. I promise this massive cake won’t melt. It was delicious and filling. We had less than 1/9 each and didn’t need dinner so when it says it’ll serve 8 it’ll definitely do that and more. There is a dacquoise praline biscuit helping to stabilise the bottom of this cake which it perfect and just compliments it perfectly. This is a big cake though so clear a full shelf of the fridge to accommodate it. The surprise I spoke of is that the houses are not solid chocolate! Both types are filled with fudge sauce studded with caramelised hazelnuts. 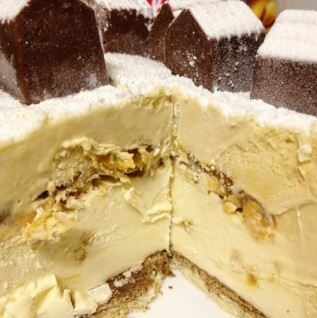 A wonderful discovery perfect to enhance the ice cream cake experience. It’s that decoration on the clown head all in a house form. It’s my childhood grown up and made posh and healthier for me as Haagen-Dazs focuses on quality ingredients in its ie cream. If you’re looking for something unique to serve this holiday season no matter what the theme of the party, the unique nature of this cake is sure to please. At £40 per cake you might want to get two in which case you’ll be given a chocolate bridge to link the village. 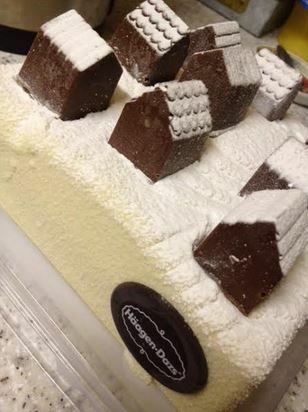 The houses have different roofs and if you get one of each you’ll get the chance to try both types of cake. If you’d like to treat yourself or your guests it is only available from Haagen-Dazs in Leicester Square so hurry and grab one before they sell out! Macadamia. Check. Dulce de leche. Check. Chocolate. Check. Perfect. Check. My kids will never forget it if I served something like this for dessert on Christmas! OMG I much prefer these to gingerbread houses! Ice cream village all the way! Wow, I’ve never seen anything like it. Very unusual. The combination of Macadamia Nut Brittle and Dulche de Leche sounds divine and I love the sound of the fudge sauce filled houses. Oh….my….god! This is an unbelievable thing!! I’ve never seen anything like this before. Lucky you having this as a child! I might have to start a new tradition with my girls. This looks amazing.